Thanks to ALL for your visits, comments, shares and pins in 2014! A look back at how the tables turned in 2014, with highlights from the months & seasons. Click on the links for some tabletop inspiration and to see the full post! They were all wonderful and gorgeous. I remember how attuned each setting was to the season. I would be really hard pressed to choose a favorite. OMGosh, Mary…such an assortment of eye candy!! My eyes danced as I scrolled down & I wondered how did I miss several of these gorgeous tablescapes? I must have slept through part of the year. My favorite is the Cameo, but then I prefer formal things, so it makes sense. 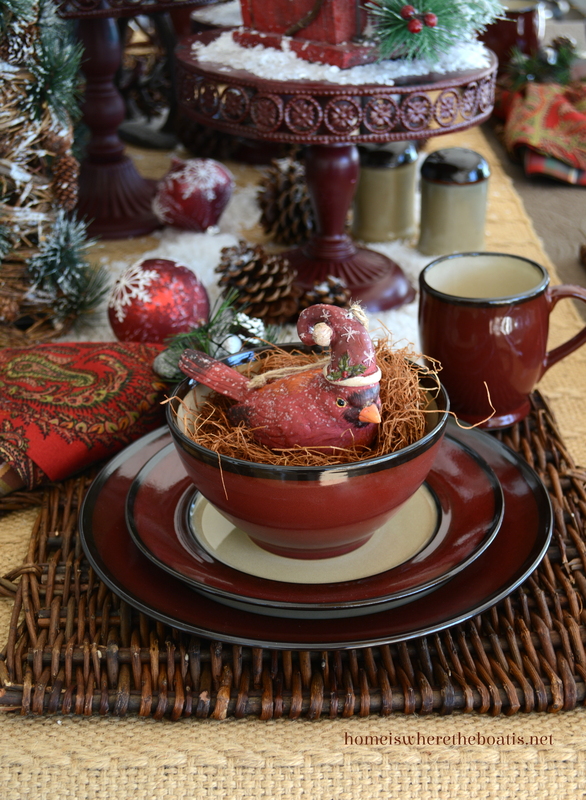 You’ve truly created a special unique display for each place setting, bringing out the best features & colors in the patterns. Like Lynn, seeing the Spring colors was a breath of fresh air. It is freezing here & snowing, too. *sigh* Thanks for the mini respite. Your year in review was such a joy and pleasure to see- every picture made me stop and admire their beauty. I would love to emulate just a fraction of your visual talent. 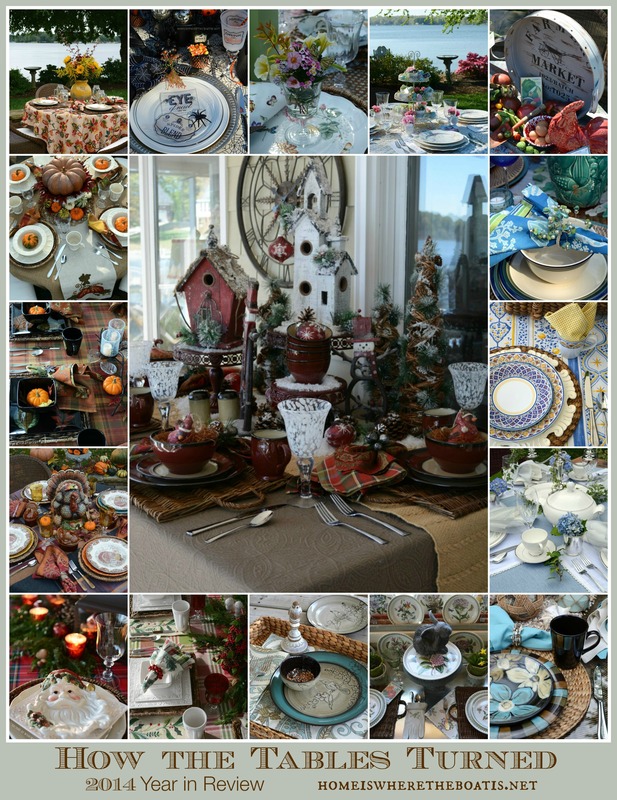 I can only imagine the time it took to organize, arrange, re-arrange, and finally photograph your tablescapes. Thank you so much for sharing your talents with us all. You are an inspiration!!! HAPPY NEW YEAR! 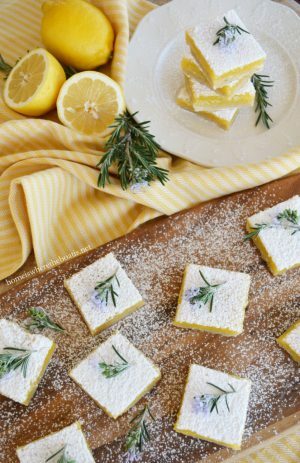 I have to admit I have admired your post so much that I was reluctant to share it with too many friends because I wanted to use your ideas myself for entertaining! Those I did share it with are permanently hooked and cannot believe your creativity! I recently used your recipe for crab bites at a New Years Eve party with rave reviews! I also have used your ideas for filling my lantern outside my window on my iron table with pumpkins in the winter, and greens and pine cones for Christmas! I love looking out at it every morning! Also a shopaholic at Home Goods I love all of your table settings! One question? Where and how do you store everything? 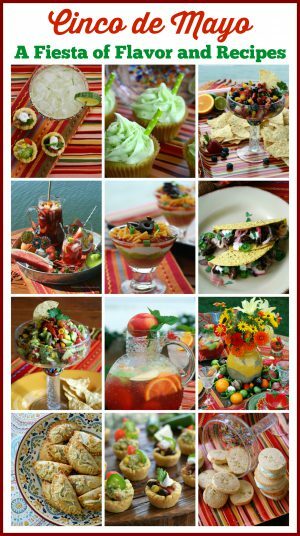 Thank you for making my mornings a wonderful beginning as I open each post with new ideas for entertaining!I LOVE,LOVE,LOVE your site!!!!!!!! Thank you for making my day!!!!!! My favorites are always Fall and Christmas!!!!!! Mostly Fall!! It was fun looking back at all your creative tables, Mary! I just can’t pick a favorite because they all are so lovely! Thanks for all the color, beauty, and inspiration. Your so talented, I love your ideas! always delightful to be retreated to all your fun! You’re simply the best at tablescapes, Mary! I missed a few of these in real time, for whatever reason, so I was happy to have the chance to read them now. Thanks for all the inspiration. 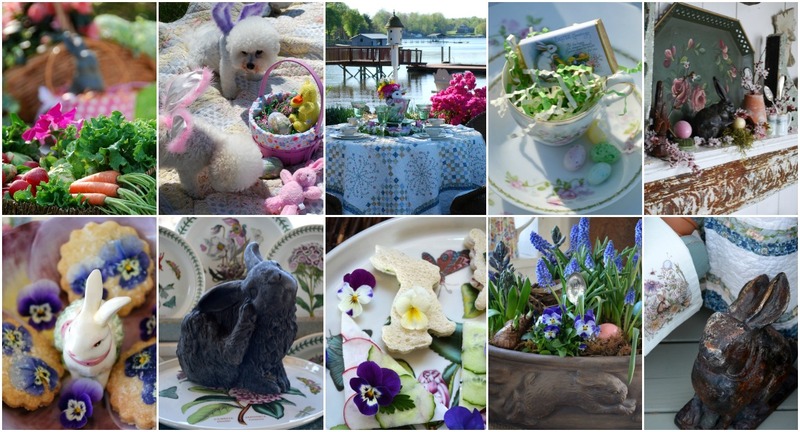 The Easter centerpiece is my very favorite…..I love Easter and the Spring colors. Thank you for all your wonderful, creative ideas. Beautiful post. I love the wooden furniture on your porch with the nest pillow. Mary, I loved the “Tour de Tablescapes” of 2014. Each one is gorgeous, but when they’re put together, the result is magic. You are such an inspiration! My granddaughter and I were trying to choose our favorite – of course she chose the ‘Halloween tablescape’ hands down. I love, love, love little birdies – so I chose ‘Nesting on the Porch’. Having said that we both agreed that each one is terrific – you are a true artist Mary and I look forward to your creativity each day. And those recipes – to die for! And lets not forget those sweet pups – just sayin’! I wernt back and looked at several again. You are the QUEEN of tablescapes. Your creativity knows no bounds. Looking forward to more inspiration in 2015! but my favorites are when you use quilts for your tables. I love them all….Hard to pick just one, but I think my most favorite is the Farmers Market Table in August! Thank you so much for sharing your creativity and eye for beauty with us! All so very lovely Mary. Thanks for the continual feast for the eyes. 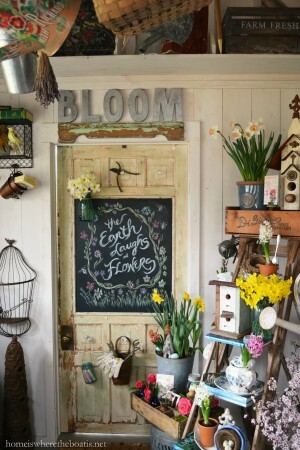 Always love anything with birds and bunnies, and the garden shed. Looking forward to more in 2015! (My bird treats turned out great – had fun making them – thanks again.) Give the puppies hugs for me, they are too precious! Mary, this post was a true feast for the eyes! Each table was superb! If you published a book of your tablescapes, I’m sure it would be a best seller! You are truly an inspiration to me and everyone who loves to set a beautiful table! Each table “turns” with exquisite style! You never stop amazing, Mary. Each post is always full of new inspiration. I’ve loved your bird themed posts and have found myself gathering bits and pieces now and then to do more “birding” for my own table. Thanks for yet another year of fabulous posts and friendship. You are a treasure! Inspiring all! Thanks for a great year and congratulations on your blog! Great review, fun looking at all your loveliness throughout the year. You are always creative and full of inspiration. I always love seeing the water in the background. Wow! What a year. Thank you for all of the inspiration and fun! 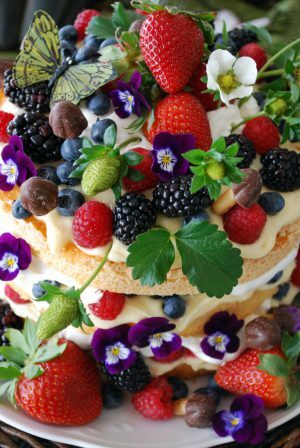 Mary…I feel as though I am flipping the pages of a gorgeous book!….You are such an inspiration to all of us…your tablescapes, your recipes, your gorgeous vignettes in and around the garden shed….you are truly amazingly talented!! Mary, what a year! Amazing five or so years that you haven’t skipped a beat. I keep marveling how you keep outdoing yourself. Happy New Year 2015! They are all so stunning! Such unbelievable talent. Thanks for sharing with us all! Love them all…no way to pick a favorite. I loved seeing so much of your creativity at once. I’ve enjoyed all your tables this year! 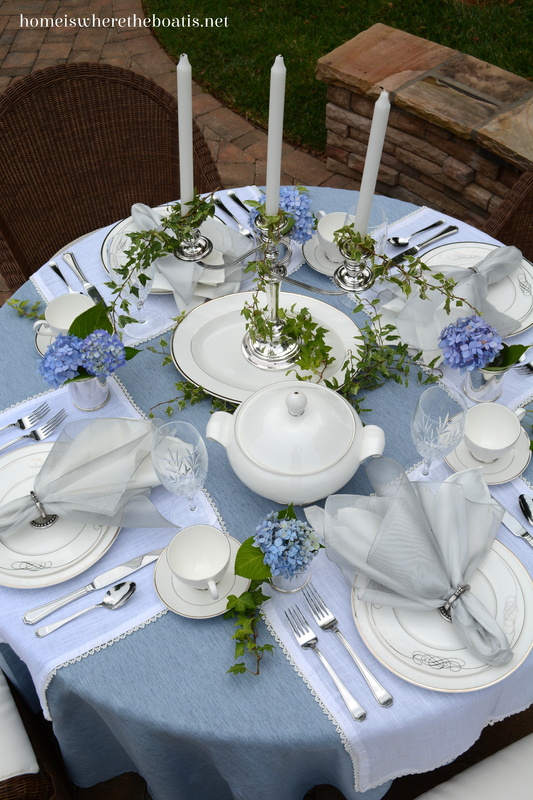 You have beautiful taste, and every table is so well planned, down to the little details. Thanks so much for this review of your year. Hard to pick, but I think my two favorites are the Farmer’s Market table, and the Christmas Plaid table. You’ve touched on my favorite things in these two posts: Quilts and plaid! Where did you find the napkin rings for the Christmas post? These two tables are so beautiful! Now Im off to see Pat’s plaid table that served as the inspiration! Thank you for a marvelous year of inspiration, Mary! you ain’t nothing but a smile maker girl! So many beautiful tables Mary!! I love the Christmas tables. Thanks for joining HSH! Looking forward to your 2015 creations.